Now that Dabo Swinney has cemented his place among college football's elite coaches, who's next? When the Villanova Wildcats won the 2018 NCAA men’s national championship, the win catapulted head coach Jay Wright into rarified air. Not only did he join the very exclusive club of active coaches with multiple national titles (Coach K, Roy Williams), but he also joined the exclusive club of Division 1 coaches who have ever won more than one national title (13). There’s no longer any denying that he’s among the elite college basketball coaches in the nation. Same now goes for Dabo Swinney over on the college football side. There were few Dabo doubters left out there, but by winning his second national title in three years this week, both of which he won by defeating Nick Saban and his mighty Alabama Crimson Tide, he cemented his status as one of the elite coaches in the nation. Among active coaches, Saban remains the top dog with six national titles at two schools (don’t let that 2003 title with LSU escape your memory). We can officially take Urban Meyer off the board, though there are plenty of people who assume the three-time national champion will be back soon enough. Swinney is now the only other active coach with multiple titles. The other three active head coaches with a championship trophy to their name are Texas A&M’s Jimbo Fisher, who did it with Florida State in 2013, and the returning heroes Les Miles and Mack Brown, who will resume coaching next season with the Kansas Jayhawks and North Carolina Tar Heels, respectively. It’s unlikely that Brown and Miles will get within miles of the College Football Playoff anytime soon, while Fisher has to contend with the buzzsaw that is the SEC West. So in all likelihood, the next head coach not named Dabo or Nick to win a national title will be a first-timer. Smart odds have one of those two hoisting the trophy once more at the end of next season, but sooner or later, which current college football coach has the best chance to join this elite group? Whoever the head coach of the Oklahoma Sooners is, that person is always seemingly next in line for the honor. If for no other reason than the fact that Oklahoma always seems to be hanging around, waiting for everyone else to slip up so they can slide in there and snag that championship. Riley is getting plenty of overtures from the NFL but seems committed to the Sooners for the time being. That’s good news because it keeps him in prime position to be the guy who brings Oklahoma their first title since 2000. Kyler Murray is almost certainly gone, but the Sooners do return most of their defense and Riley just hired Ohio State’s Alex Grinch away to be his new defensive coordinator. This season might not be just right, but if Riley sticks around long enough, chances are he’ll get his shot. Say what you want about Notre Dame’s bona fides, but they’re tailor-made to make it to the College Football Playoff under Brian Kelly. He’s got a solid number of starters returning, including quarterback Ian Book, which means that high-powered offense might even be better. The defense might be another story, as well as the 2019 schedule, which includes road games at Georgia, Michigan, Duke, and Stanford. It’s likely that they’ll take a step back next year but you never quite know when Kelly and the Irish will be back in the title hunt. They never stray that far away. If anyone coach seems to have the best shot at getting on the board next season, it’s Smart. The Bulldogs cried foul when they were left out of the CFP this season (but didn’t do much to make their case in the bowl game). Still, they return seven offensive and eight defensive starters next season and Jake Fromm will be back for his third season as a starter. They’ve got the talent to reload and fill in the necessary gaps as well. With an “easy” schedule, at least by SEC standards, they’re the favorite to represent the SEC East in the conference title game. Chances are they’ll dance with Alabama once again, and if they can somehow find a way to win this time, who knows what might happen next (Probably still have to beat Alabama again in the CFP…). True or not, Harbaugh has fashioned himself a reputation for being the best coach in college football… between February and September. 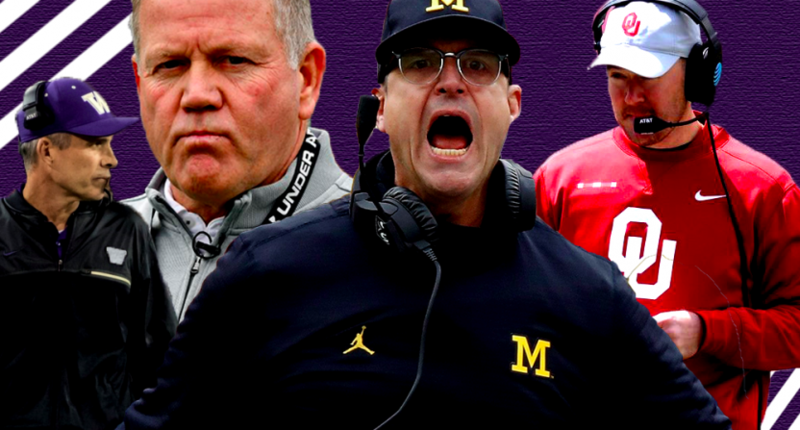 However, despite a few seasons of hype and some very talented teams, he has yet to get the Wolverines over the hump and remains in Ohio State’s shadow until otherwise noted. With Urban Meyer gone, that could change. Despite constant interest from the NFL, Harbaugh seems committed to seeing the return of Michigan to the top of the heap through. 2019 could be a good shot, as he has quarterback Shea Patterson and a bunch of offensive linemen returning. Just like 2018, it’ll come down to the defense. If and when Harbaugh is able to find some balance on both side of the ball, he has all the hype and tools he needs to join the club. In some ways, he’s the one coach who’ll always remain a disappointment if he never does. A bit of an outside choice, perhaps. And you could make a case that Mike Leach has a better shot at Washington State right now. But Petersen has proven that he’s capable of taking programs to the very top of the game and can do so fairly often. The Huskies are now three seasons removed from their CFP berth, but UW has won the Pac-12 in three consecutive seasons and returned to the Rose Bowl this year. Oregon has lost a step and USC is still rebuilding, so the road to the conference title still runs through the Apple Cup. UW has some work to do on defense next season, but they should remain at the top of the conference for a few years to come, and who knows what else might break right for them and Petersen. Other coaches who have a decent shot to make the list: Mike Leach, Washington State; Ryan Day, Ohio State; Dan Mullen, Florida; Tom Herman, Texas; Ed Orgeron, LSU.